Photography Submissions to November 2011 Archived. Walsh's Pyramid taken from the east at about 7am. Has had a little bit of Photoshop to bring the contrast in the clouds. If you look hard to the right you also see Gordonvale Mill. Oh, how I wish I were there. Would you mind if I painted this lovely scene? It is so inspirational to me. Click here to return to Photography. 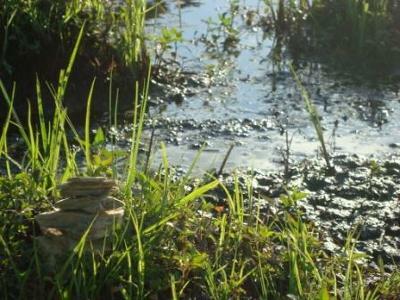 I photographed a collection of rocks placed by the waters edge just as the sun was setting. I liked the reflection of the light on them and their position in the composition. Lucinda, that's a great photo of an interesting sculpture. Have you heard of the British environmental sculptor, Andy Goldsworthy? I think that you would love his work. 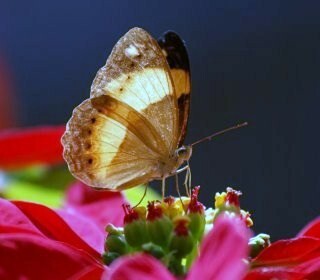 This butterfly was conveniently sitting on my poinsettia bush in Atherton one May morning last year. When I took the photo I didn't know its name so I wrote to a butterfly expert to enquire. He told me this butterfly was called a Yoma Sabina and is actually a poplular butterfly to release at special ceremonies such as weddings! Tableland Butterflies are one of the many things I miss now I am living in the south east corner of Queensland. 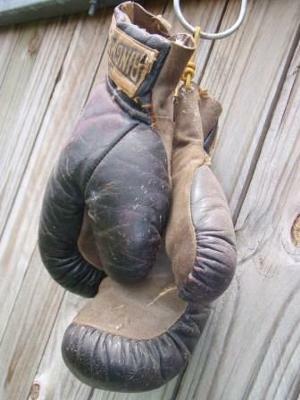 I just found some old boxing gloves in my shed and thought I would take some pictures of them. That's a great photo, Jess. The gloves look quite worn and I was thinking that they could tell quite a story if they could speak. Do you know who owned and used them? Thank you very much for sending in your photo - maybe you could make a series about how old objects, viewed in a different way take on new meaning - or just tell a story...? what's a roman hero got to do with an australian flower? 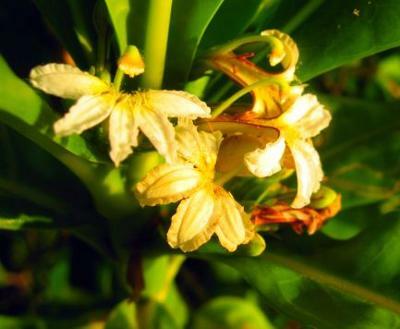 Neither a lettuce nor a tree, you find this shrub on our beaches. The flowers are strange, 5 petals or hand shaped, that's why its name is scaevola after a Roman hero, who burned his hand in defiance when threatened to be burned alive. He lost the use of his hand, so, was left-handed and named Scaevola. It seems a strange common name for a beautiful and interesting flower - lovely photo. Thanks for sharing! 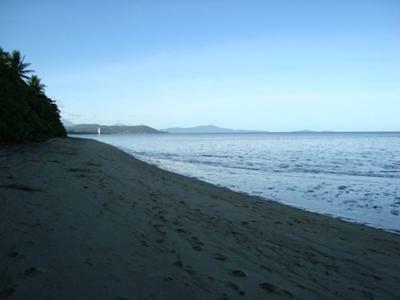 My husband and I drove to the Daintree River and to Cape Tribulation and just enjoyed the beauty of the country and each other's company. It was a wonderful break for us both. 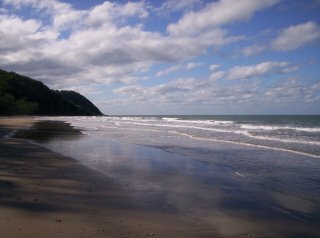 I wanted to show you a picture of the beach in late afternoon - it was just gorgeous. I hope I captured the essence of it for you. I love to paint and this scene is so inspirational, so restful. I can already visualize it on a canvas. But I have so many ideas that are still in my head that I want to put down in paint on a canvas. On Christmas day, 2008, my family and I had a huge Christmas lunch, then went for a walk along Cooya Beach. We walked all the way down to the mangroves. All day it had been hot, but when we went down to the beach there was a nice cool breeze blowing. The sun was setting, making long shadows along the beach. It was so beautiful. I am a self appointed art critic. I rove around and examine art work and document my findings. This beach scene is exquisite. The waves are perfect. Boats with sails even show the reflection in the water. Sky is beautiful. The ultimate is the footprints in the sands. You seem to have covered every aspect of a true beach scene. Even the gulls in flight. You rate 5 stars from me. Loved the picture so much I did paint it. Almost complete. It was a multi-day project. Looking for just the right frame for it but I want to scan it before I frame it. Then I will offer it for sale. This is a beautiful photo and would make a wonderful painting. I hope you enjoy painting it. Hard to realize - you are in mid-summer weather, and here in Chicago, IL. (USA) we are shoveling snow and shivering with single digit temperatures - like 8-9 degrees. I had to look at this again, Lucinda. I could not resist the urge any longer; The inspiration got too great. I got out a piece of water color paper, made a sketch, and everything looked so real and just went into place. Will start painting tomorrow, as I want to sleep on it. Will send a copy of it to Jill when complete. It should make for a quick sale. Yes this photo could be quite an inspiration to paint a painting. It does look very peaceful and restful. It is a beautiful, quiet beach. Now people can see how a painter gets inspired. This so reminded me of Light Houses and sea shores. So peaceful and restful. This visitor to Low Isles was photographed by Rick, caretaker on Low Isles, near Port Douglas in Tropical North Queensland. Rick are you able to tell us something about this bird, also about the beautiful and colourful wompoo pigeon which you so cleverly photographed in flight? 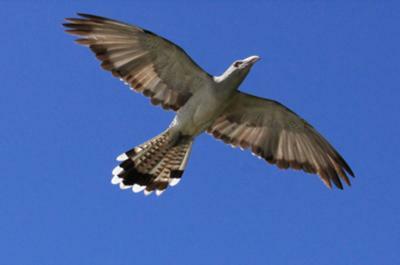 The Channel-billed cuckoo is migratory, breeding in Australia spring /summer then back to New Guinea and other islands to the north over the winter. The Wompoo fruit dove I must admit was a lucky shot, while taking photos it flew off. I'm always trying to capture moving subjects. I found this little fellow one evening. It's a white lipped green frog. That's a great picture of your visitor! 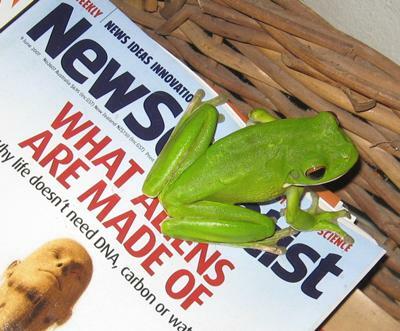 We used to have one of those lovely green frogs living in a pot plant on our verandah. It used to 'plop' onto the verandah each night and say hello before going off to hunt. They really are nice frogs, aren't they? I wonder if yours was reading up on the aliens article?? 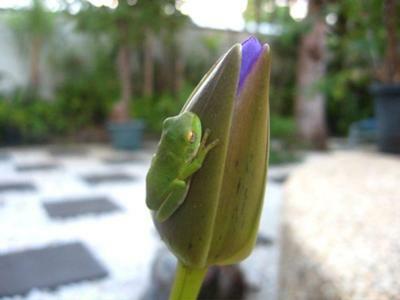 Sitting on a bud of a waterlily this green tree frog caught my eye - baby frog , so small, so perfect.. I am an obsessed, mad keen cupcake-a-holic and eat, sleep and dream of nothing else. 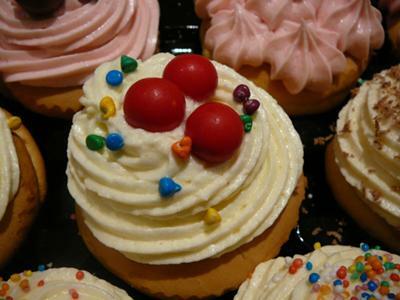 What is your favourite part of a cupcake? Is it the sweet, velvety butter-cream frosting on your first lick? Or is it the moist and light cake that you bite into as it squishes between your teeth? Perhaps it is the sweet, buttery flavour of the cake with the hint of vanilla bean? I have a police man friend. I always tease him about his craving for "COP" cakes. 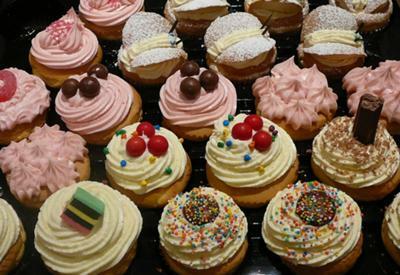 But - went into a bakery and asked for cupcakes and was curtly informed that they only carry MUFFINS. Pardon me, I'll have "some of those!" For me, it is the texture of it all. The crunch of the hundreds and thousands, the smoothness of the frosting and the moist and slightly stodgy cake as I chew. One never seems to be enough, but if you stop at one, the thrill of the next cupcake experience is enhanced, as if it is the first time. Much like your first kiss with a fresh love. There is a thrill of anticipation as your eyes feast on the colours and textures, a true work of art. One that lasts only as long as the last bite but the memory of which lingers until the next art-feast. Yours in cupcake. This is a picture of a young King Parrot I took while it was feeding. It was a wild bird that came down to the verandah where I was sitting and calmly allowed me to take its photo. The verandah was situated just outside Atherton near Tomoulin. Taken in my backyard. 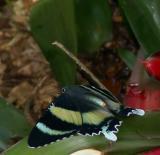 The male butterfly was fluttering around a female of the species. Ryan, this is a lovely photo. 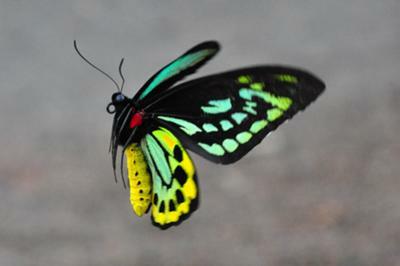 Are you able to tell us anything about the habits and life cycle of this beautiful butterfly? These large butterflies used to come right into my Atherton front yard. They seemed to love the bottlebrush trees and bromeliads I had planted there. 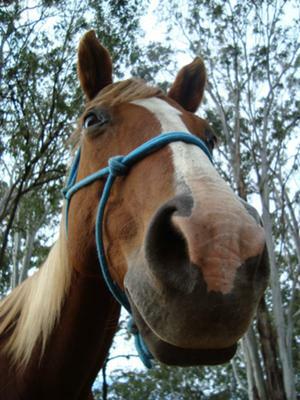 This is a photo of my horse Meggs. I rode her at the horse sports in Herberton and at the Mossman Show last week. She's a good pal! Ted, I apologise to you for not answering your comment until so late. Thank you Ted. Yes I like to take photos from different angles and perspectives. It makes it more interesting. I did not come any places in the events but I had a lot of fun. Yes I do love her so so much. Her name is Meggs and she is a 15 year old Australian Quarter Horse. She is my best friend. What a great idea to paint this photo. You can paint it if you want. My goodness! Jill suggests you draw your horse, and artist Ted E. offers to paint it. Has anyone contacted him on his offer? and he does have a good touch with his brushes. What some people do to horse around? Pun. Yes, some people horse around, and there are those that do it creatively. This is the real way to do it, and still have clean fun. Incidentally, did you win a prize. What place did you achieve? What a beautiful animal, and I bet you just love it (him or her). All you lacked in your information is its name. And what breed? Ted E. would offer to paint it. Confer with Jill. Lucinda, that horse has character! Have you ever tried drawing her? What do you do to look after her? I expect that it is lots. 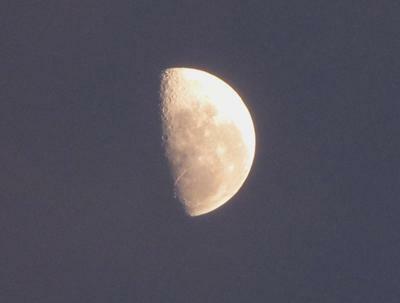 The trick is to take such shots at either dawn or dusk, and to assess when the contrast between the moon and its sky background permits the maximum 'detail' to the achieved. That is usually when the the camera's in-built metering system budges from where it has sat static overnight, and shows a significant reading of (say) 1/80th second (exposure) at f5.6 or similar. If the mornings/evenings are clear, it is possible to 'bracket' shots taken at five-minute intervals, until you secure an optimum exposure. In fact, 'optimisation' is the name of the game, as I use 'photo-optimiser' software by 'Ashampoo' in Germany to automatically darken the skies for me. (Wonderfully simple software, every digital-photographer should have it). If 'optimisation' does not do the trick, I carry out the same process manually, using a 'graphics' programme. The picture, as you might imagine, has had a fair amount cropped off to give the image the prominence I feel it deserves. You certainly did get a beautiful photo. 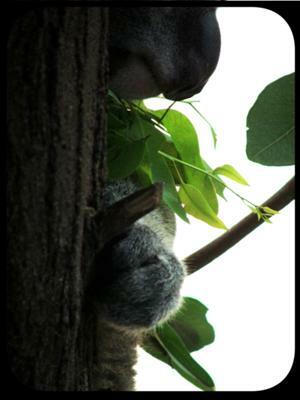 I think it is the best photo of a koala I have ever seen. 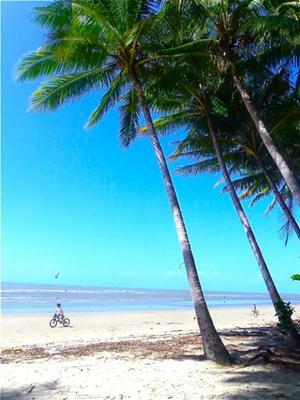 The far end of Four Mile Beach is a haven of bending coconut trees scattered and pilfering the warm sunshine that reflects the white sparkle in the soft waves. The natural beauty you breathe in is certainly relaxing, but there's also a rejuvenating energy that can be absorbed from the sounds of squeals and laughter of children playing, the feel of the warm salty sands between your fingers and the sight of the windsurfers dancing in the sky. Great photo, Heather! That long stretch of beach is pretty special, isn't it. I think that those coconut trees are the 'dancing' ones that I painted here - https://www.art-in-tropical-australia.com/original-tropical-paintings.html - scroll to the bottom of the page. But have you noticed how erosion is taking its toll on them, right at the southern end of the beach? There are at least half a dozen gone and more likely to follow. So plant some more if you find any sprouting! I hope that you continue to enjoy finding lovely spots to photograph.